These are high vibration crystals, that also deliver clarity of mind, by cleansing the aura of negative energy build up, both within the physical and the etheric body. Using White Selenite can be powerful for activating dormant abilities from past lives. It has the capacity to take you to the higher realms, which often happens quickly. Selenite is a transparent stone with a white reflection in the correct line of sight. In this case, my piece was very angular; I found that most of the pieces that I was choosing from were. It was generally quite easy to suspend the stone. I kept most of the half-haphazard decoration above the stone as well. A simple, quick design that I whipped up whilst I was taking a break from my other projects. 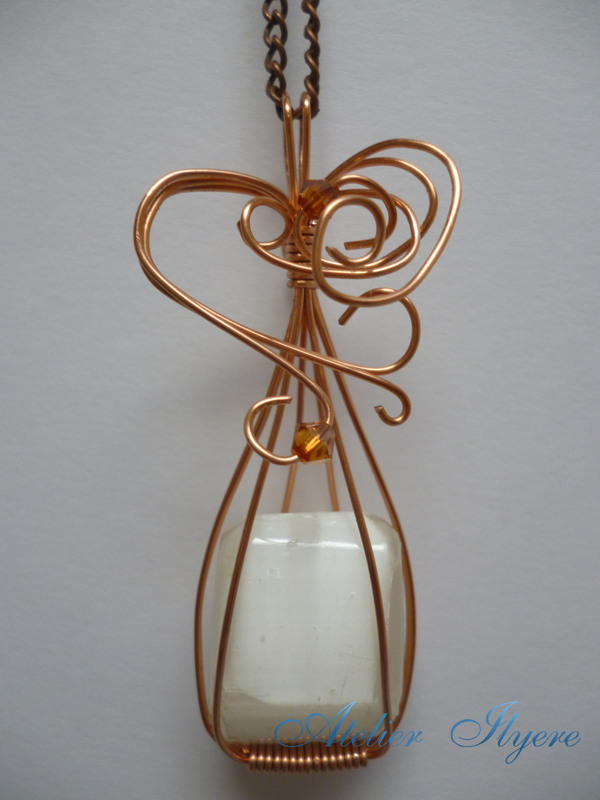 This entry was posted in Gemstones, Jewellery, Pendants, Swarovski, Wire and tagged Copper, Gemstone, Selenite, Swarovski, Topaz, White, Wire. Bookmark the permalink.